Projects on Interstate 66 and Interstate 270, two of the region’s busiest traffic arteries, have cleared federally required tests, which means work on the projects can proceed. WASHINGTON — New toll lanes on Interstate 66 outside the Capital Beltway and a series of small tweaks to Interstate 270 have passed federally required air quality testing, which will allow work to move forward. A draft National Capital Region Transportation Planning Board air quality analysis expected to be presented Wednesday finds the two projects conform to the region’s long-range air quality plans. After a public comment period, the analysis is scheduled to be formally approved Oct. 18. The Virginia Department of Transportation has scheduled final design public hearings on the I-66 toll lane project in mid-November, but Transportation Planning Board documents indicate a final determination on which locations will actually have on-ramps or off-ramps connected to the toll lanes will be made prior to the regional body’s Oct. 18 vote. An interchange at Nutley Street. The inclusion of several ramps, like Nutley Street, has already been decided, but the decisions were not finalized before the air quality analysis began last spring. The November public hearings are largely intended to focus on more precise designs of each potential ramp. The two toll lanes in each direction next to three regular lanes are due to open in 2022. Separate rush hour-only tolls for solo-drivers on begin in December on I-66, inside the Beltway. In addition to the I-66 project, the air quality analysis also supported a new Interstate 95 toll lane ramp near Quantico that will allow northbound buses and cars to exit the toll lanes onto Russell Road. Work on repaving, re-striping and adding new traffic lights at the ends of on ramps for Interstate 270 is now getting underway in Maryland. 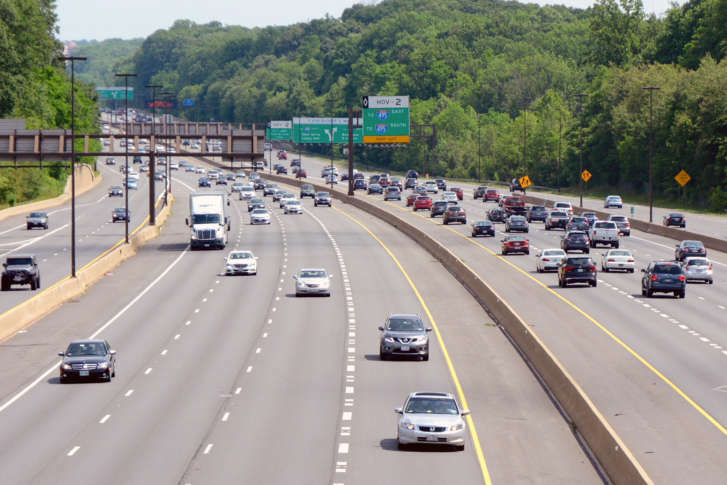 The State Highway Administration is starting with work on the spur connecting I-270 to the Outer Loop of the Capital Beltway. New lane markings will continue the left lane from I-270 onto the Beltway. The work requires lane closures on southbound I-270 at all times, except during the morning rush hour and Sunday through Thursday overnight lane closures of lanes on the Outer Loop. The work on this part of the spur is expected to be completed by the end of the year, with additional work elsewhere along I-270 coming later. The air quality analysis also approved Maryland’s plans to build a new Harry Nice Bridge by 2023 instead of 2030.